Set in present day Mars, the challenge was to create a story that narrates the first discovery and encounter of an unidentified spherical object – The Traveler. In order to realize the fully CG film, an entire world had to be designed from scratch – everything from the astronauts to the Mars environment, weapons and lunar module. Since the sequence precedes the game by hundreds of years, it presented various challenging and exciting creative problems to solve but also various technical demands for the CG team. 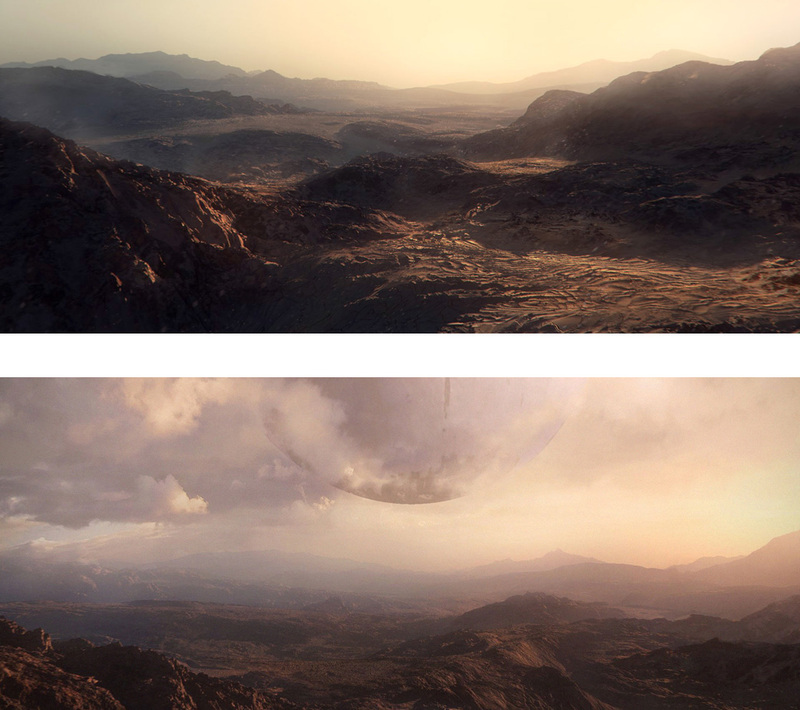 During the initial conversations with Bungie, the brief was to create a sequence that would communicate a present day landing on Mars, 500+ years before the setting of the game itself. We were then provided a script from which we were asked to explore the story of the landing and the journey of the astronauts as they seek out a suspicious object hovering above the terrain – The Traveler. 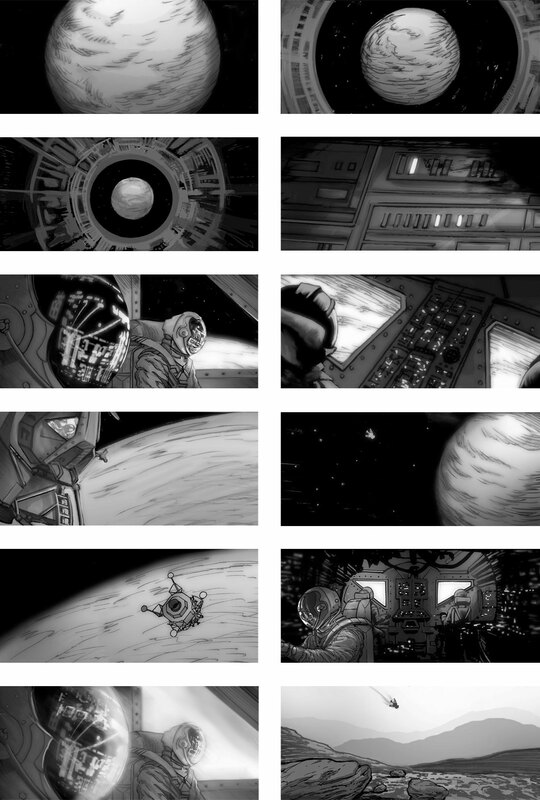 We presented initial storyboards and concept art, along with a written treatment describing how we intended to not only tell the story, but also our stylistic approach to the execution. This was followed by a thorough storyboarding process with our frequent artist, Doug Stambaugh. 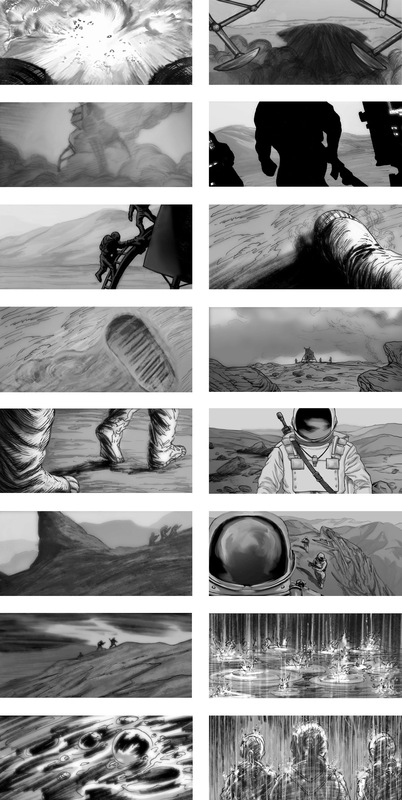 We drew every key moment in the sequence, which was then divided into scenes and shots. Quickly sketching our ideas provided us a lot of freedom in experimentation with camera angles, composition and story structure. Since some elements of the script were revised a few times, we always had the foundation of the resulting animatic created from the drawings to go back to. 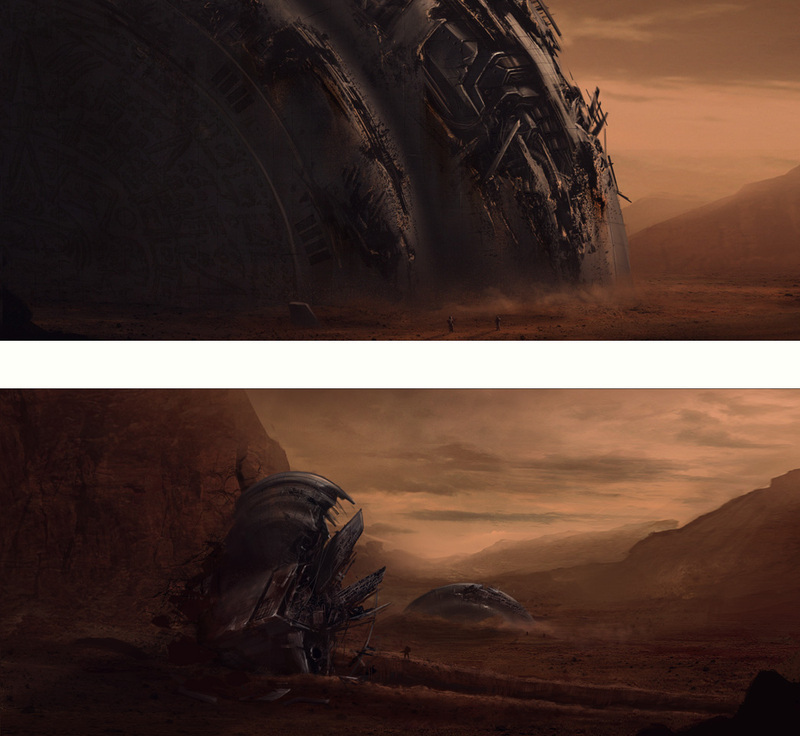 Early on in the pitch process, we worked with concept artist Peggy Chung to develop the scale and texture of the crashed ship in a scene that was later omitted from the story. For the development of the landscapes, we researched a huge range of Mars photography. We realized that it is just a vast, huge landscape and that we would have to modify and stylize a lot of the terrain to create a more immersive environment. We collaborated with digital concept artist Gavriil Klimov to explore the augmentation of the Mars terrain and Matt Gilson, our Lead Matte Painter, helped us get the look and feel we wanted throughout every shot. We first did low-res previz that had basic geo to help carve out compositions. Matt was able to use this as the initial base for his paintings. We then used projection methods in Nuke to get proper life into the environments. We decided that the ground plate for the “first step” on Mars should be created practically. Using a mixture of different soil textures including fullers earth, we eventually arrived at the desired Mars like ground texture. 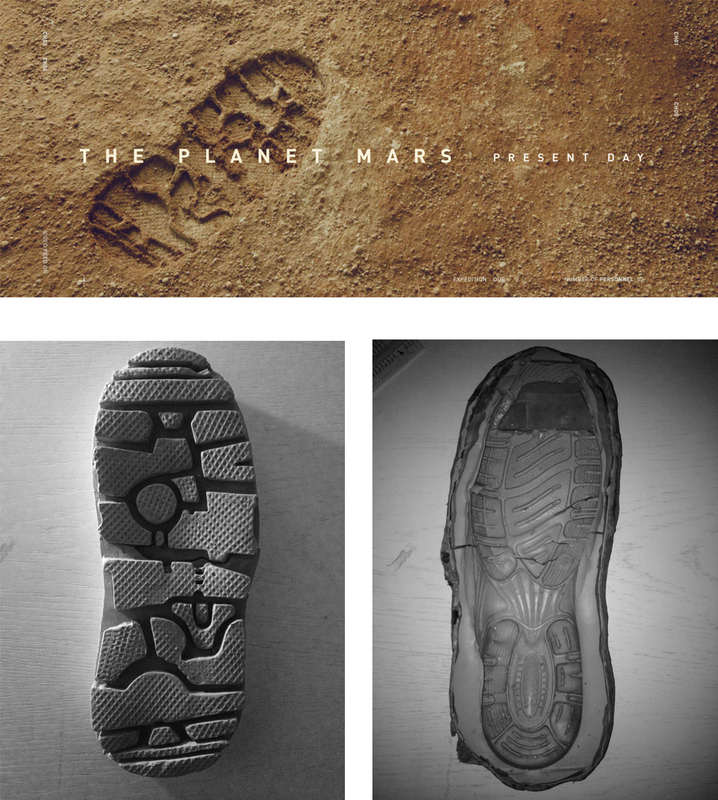 The footprint was achieved by creating a mold that was attached to the bottom of a regular sneaker. We then practically filmed our talent walking onto the soil along with practical wind effects to give life to the top layer of soil. The resulting background plate was then brought into flame and comped with our CG astronaut foot. For the lander, astronauts and weapons, we started with simple photo reference. Bungie provided the Lander and weapon reference as they wanted to make sure they were immediately recognizable, and identifiable as present day. One of our lead artists, Bora Jurisic, put a lot of love into the details of the Lander, and the assets were both modeled and rigged in Maya. The astronauts were a hybrid of the traditional space suit, other pressure-suits, and a bit of our own design. They needed to be cool looking, but still believably functional. Senior Modeler, Dan Katcher. (lead dragon modeler for Game of Thrones) crafted the suit with constantly developing direction in order to achieve the correct balance between form and function. Paul Fedor’s texture work on top of Dan’s models really gave the astronauts the realism and believability we were hoping for. 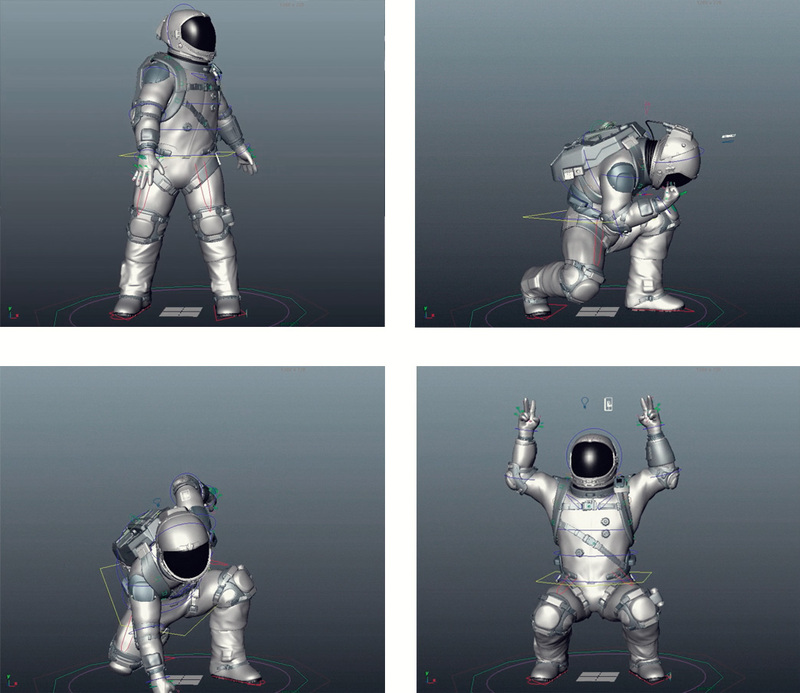 The astronauts, as well as some of the terrains, were sculpted in ZBrush. The Lander and weapons were modeled in Maya. Rigging and animation were also out of Maya. 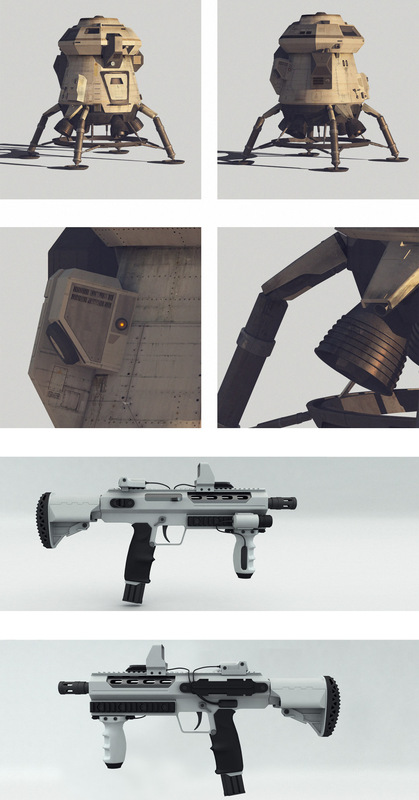 Below are some very early model explorations of the lander and weapons. 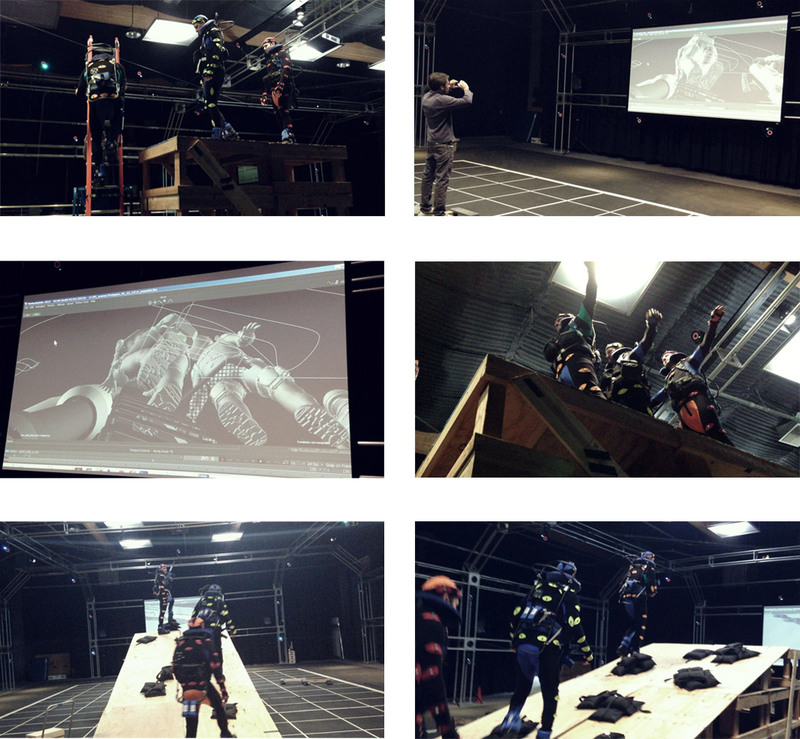 Motion capture of the astronauts in various situations was performed at the Activision Capture studio in Los Angeles by Scott Levy, Mikal Vega and Mitch Gonzalez. The data provided an excellent base for the natural intricacies and weighting needed for the animation. TD Peter Christensen set up the controls for the Astronauts. We made the decision to push the previz a little further than we normally would and actually sketch out some suggestion of rough body language and interaction between the astronauts. Even though it was temporary, we also used the time in previz to suggest lighting direction for the time-lapse section and majority of the other shots. Fx played a huge part in complimenting the development of the story and we considered the atmospheric elements almost as characters themselves. The story has a mood to it that gets heavier as the journey of the astronauts progresses. The idea was to slowly have a presence of a storm coming thus making conditions harsher as they travel further. Prologue had never really done vast, large scale fx before, so it was very heavy on our pipeline. Landing Allan McKay as our FX Supervisor was a huge boon for us. He was able to make preset tools for the fx team (Patrick Schuller, Benjamin Liu, and Hnedel Maximore), for a lot of the elements, to drag and drop into shots as needed, which saved us a lot of time. 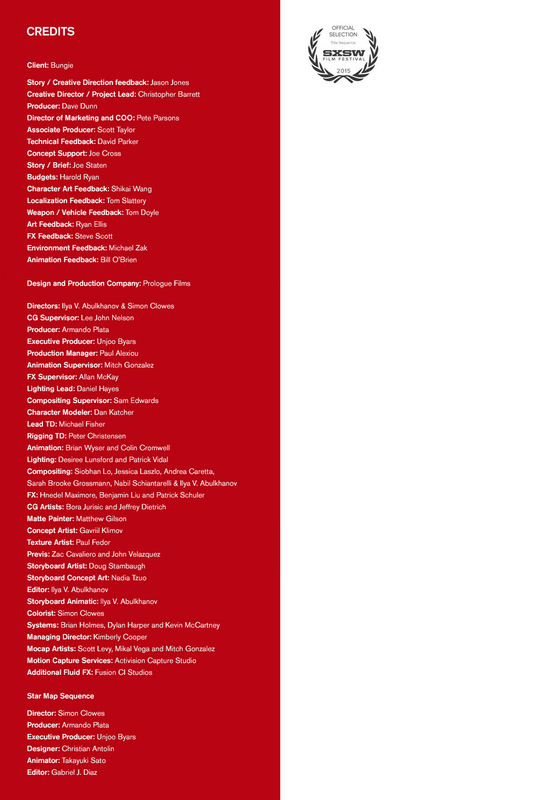 However, a lot of them still had to be tweaked to help keep tone and mood relevant to story. Initially, towards the end of the cinematic, we had a scene that involved heavy amounts of rain, clouds and harsh weather conditions. We had the challenge of creating drips and splashes of rain interact with the astronauts and surrounding terrain and involved meshing out tens of millions of droplets. McKay Achieved this all within 3DS Max, building the entire rain system in MaxScript. We spent a lot of time researching and conceiving the look and lighting style we wanted. We found out that the hues on Mars are different than what we know them to be. The consistent brownish red you see in NASA photos aren’t always necessarily the accurate colors. It’s color corrected by NASA. But it’s the color we recognize as Mars. We used a lot of matte paintings for our environments, which gave us solid background plates for Daniel Hayes (Lighting Lead) and the lighting team to light too. Deciding what render engine to use to accomplish the unique look we wanted was vital. We needed something robust yet small house friendly, and because of the ambitiousness of our vision, on the given schedule, render speeds were crucial. In the end, V-Ray was the obvious choice. Other than the FX, all rendering was done in V-Ray. 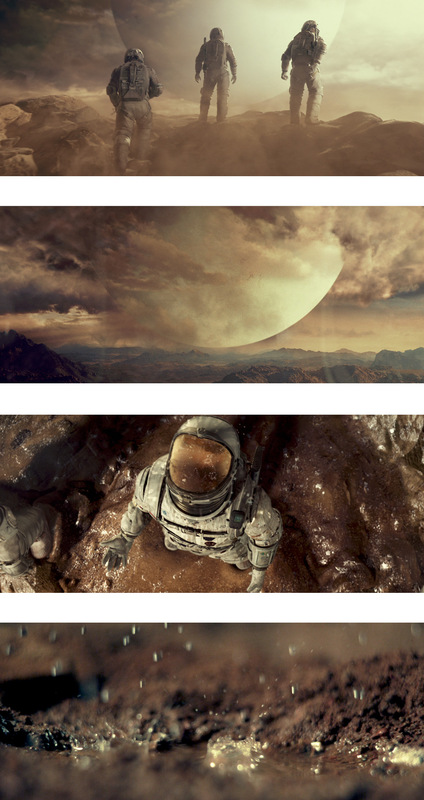 The Destiny opening cinematic was chosen as official selection for the 2015 SXSW Film Festival in the title sequence category.